Please note that not all colors shown may be available at the time of order due to the fact that these items sell out quickly and are always in limited supply. 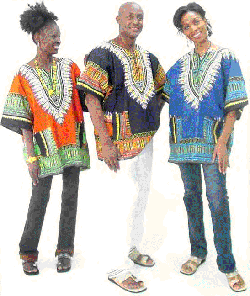 Stylish 100% cotton Dashikis from Gambia. Hand made to be comfortable in any climate. Loose fitting one size fits all garment with 48" maximum chest measurement and 35" length. Some colors available in X-Large sizes with approx. 60" chest and 35" length. 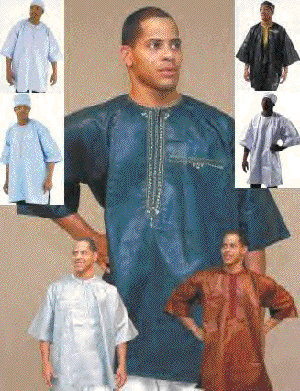 Authentic African hand embroidery. Choose from Blue, Lilac,White, Silver, Purple, Navy or Black. 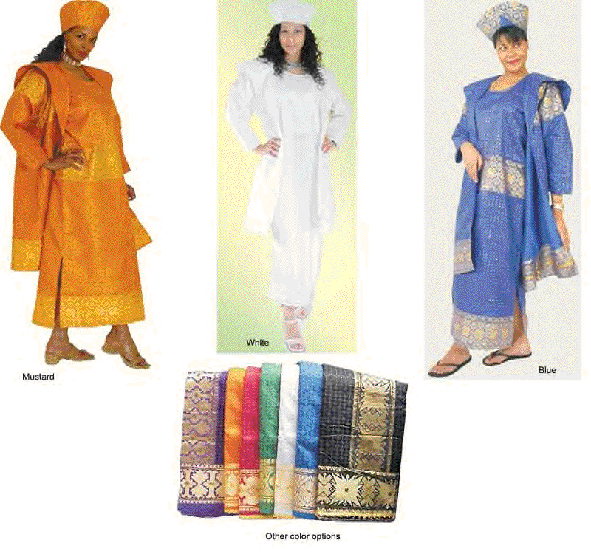 Each comes with gold embroidery, the work of Africa's own tailors. One size fits all. 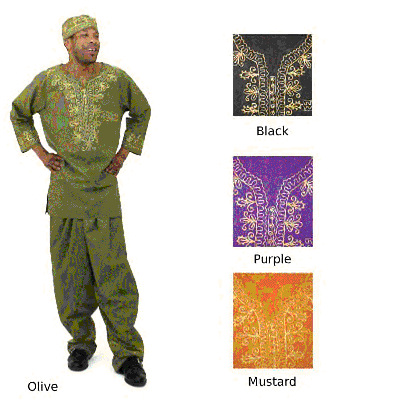 Stand out and be different with this comfortable three piece embroidered pant set. 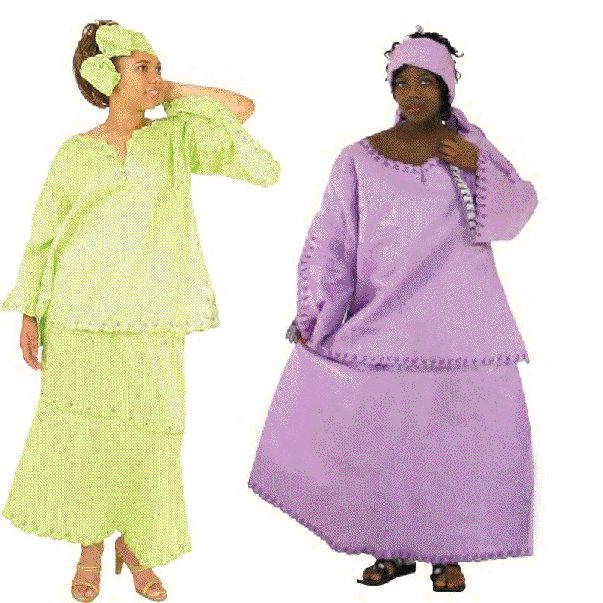 Made of soft crinkle rayon, best if hand washed. Chest measurement 58". Inseam 30". Drawstring waist. Available in Burgandy, Lime Green, Blue, Red, Turquoise or Purple. One size fits most. You can specify the color on the shopping cart page. Made in India. Kente is Africa's number one design, captured beautifully in this kaftan. Adorned with gold embroidery and matched with a headwrap. This look will define a unique African style wherever you go! 100% cotton, best if hand washed. Made in India. 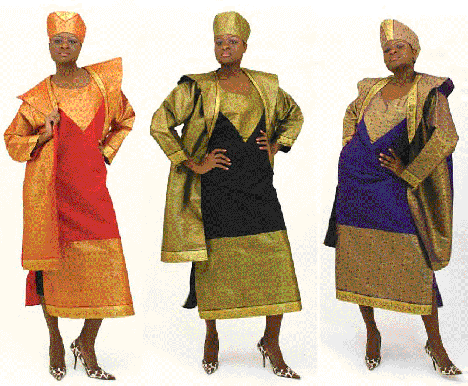 Delve into a new realm of elegance and attention-getting African style with this three-piece dress set. Comes complete with sleeveless sundress, duster and crown (with velcro clasp). One size fits all; free size fits up to 47" bust, and fits up to 48" waist. Plus size fits up to a 54" bust, 52" length, and jacket is 42" long. Made of 100% Viscose, best if hand washed. Made in India. Available in free and plus sizes.Colors may vary with each shipment.When ordering one set please give a first and second color choice. The guest of honor. 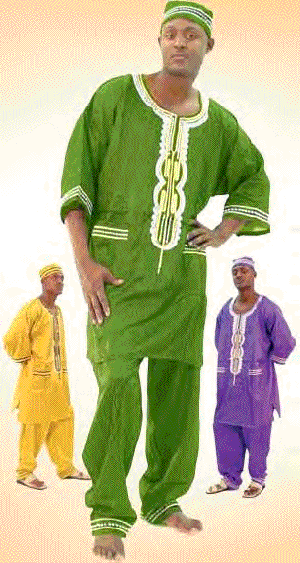 George fabric three-piece set. 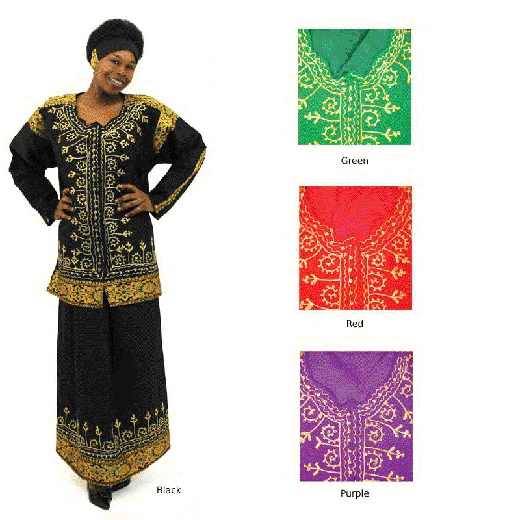 Includes top, head wrap, and skirt. Hand wash. 100% viscose. 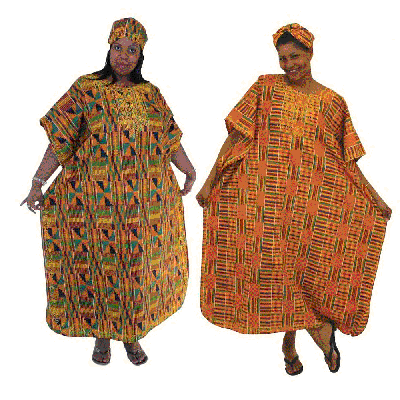 One size fits all; free size fits up to a 47” bust, 33" shirt length, 46" drawstring waist, 36" skirt length. Plus size fits up to a 54" bust, 34" shirt length, 54" drawstring waist, and 37" skirt length. Made in India. Please sepcify 1st & 2nd color choice on the shopping cart page. 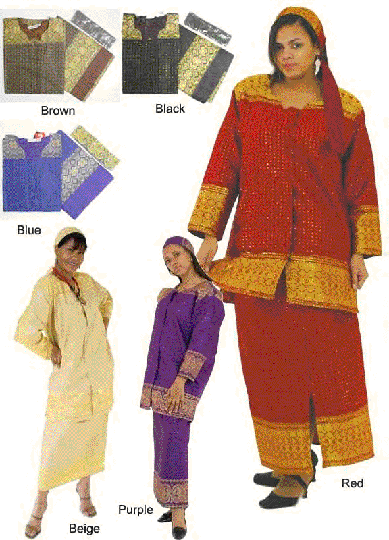 Have all you need for that special night with this four piece dress set. Comes complete with dress, duster, and hat (no purse included). Comfortable and sensual in purple with gold embroidery. Made of 100% polyester twill, best if dry cleaned. One size fits most. Fits up to 50" bust, 50" waist. Dress is 40 " long with a zip-up back, duster is 42" long. The hat is adjustable. Made in India. Fits a small through a 2X. Available in Black or Purple. Please sepcify 1st & 2nd color choice on the shopping cart page. 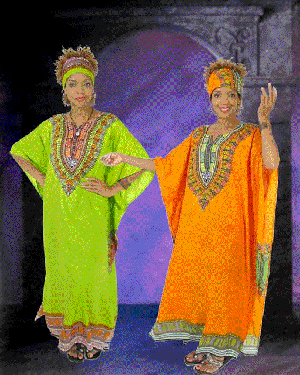 Take your fashion sense to the heart of Africa with this exclusive elephant sleeved brocade set. 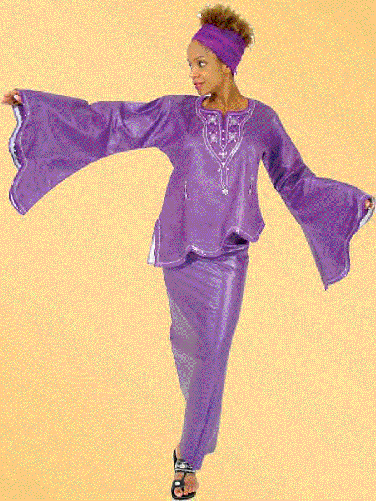 Comes complete with a wrap skirt, asymmetrical blouse, and head wrap. Fits up to 47" bust and 66" waist. Wrap skirt fits any size hip measurement - 50" max. length skirt. 100% cotton brocade, best if hand washed. Made in Ghana. Available in Black or Purple. Womens three piece embroidered brocade skirt set. 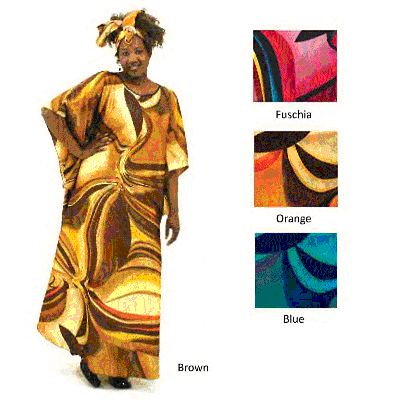 Embody elegance and grace with this African-made skirt set. Comes complete with elastic waistband skirt, top, and headwrap. Perfect for that evening out, or any special ocassions. Available in lavender or green. Fits up to 56" bust and 46" elastic waist. Skirt is 46" in length. 100% brocade. Available in Lime Green or Lavender. Made in The Gambia. C-W470 $89.99 per set.